What is Sproutlore really about? Sure, there’s the magazine and all that, but what’s more important is meeting one another, and most importantly of all, meeting with Robert Rankin, having a laugh and perhaps a beer or two. For the past few years, we’ve tried to hold an event for our members along these lines. 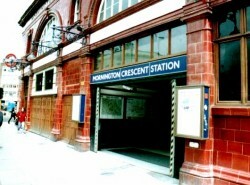 This year is no different, and we thought it about time we paid a visit to one of the most mystical venues from Robert’s books… Mornington Crescent Underground Station. The plan is we are going to meet at 12 o’clock at Mornington Crescent Underground Station. There are loads of seats just outside the station at the fork in the road. Mornington Crescent shouldn’t be hard to get to (it’s on the Northern Line of the London Underground if you have any trouble). The day will be Saturday the 28th of July. We hope (though we are still trying to arrange this with London Transport) to have a tour of the station and then we shall have a picnic around the corner from the station where there is a small park. At around 3 O'Clock we will head out towards Brentford on an open topped double-decker bus. Robert is currently devising the route to take us on an interesting and intriguing tour. Once in Brentford we take a whistle-stop tour of the famous spots in the borough, with Robert showing us around. We will end up in the pleasant pub garden where we finished off the boat trip, two years ago. Once there we hope to organise a bit of food, and a few games, some weirdness and then an auction before we finish up at around 10 O’Clock to allow people time to head home. There are quite a number of B&B’s in Brentford for anyone coming from farther afield. As usual there are a number of rules and conditions, and a small charge to cover the costs of organising this event. The cost will be Stg£10 for those of you in the UK and IR£13 for our Irish members. There will be a limited number of places available due to the amount that can be seated in the bus, so please book early or you risk being disappointed. 1) Sproutlore accepts no liability for any ill occurrence during the course of the day, any injury to life or limb, mishap, any theft or damage, or bad weather, and death by accident or neglect. 2) If the event is cancelled for any reason, we will endeavour to organise a substitute event or at worst refund as much as possible. We accept no liability in such an instance. 3) Sproutlore may eject any attendee at any time during the course of the day, for any behaviour that is deemed unacceptable. 4) If you have an issue with i) London Transport staff, ii) Bus staff, iii) Stewards, or iv) Bar staff, you must advise the Sproutlore representative first. You are not allowed to enter into argument with such people, you must allow us to resolve such issues. 5) The closing date for the receipt of monies will be the 30th of June. This allows nearly six months to reply, but as we need a bus-load of people to make the event work it is essential that members sign up as soon as possible. 6) Finally, you must agree to do nothing that would lead to the detriment of the club. Please note that this event is now fully subscribed and we are no longer taking bookings. Click here for latest information for those attending.